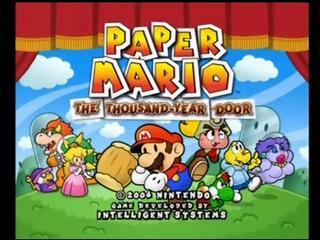 The sequel to Paper Mario was released in October 2004. Mario journeys to Rogueport after Peach writes him a letter, including a treasure map she bought. When Mario arrives, Peach is nowhere to be found. Mario soon makes friends and learns about the ancient town buried under Rougeport and the crystal stars required to open the mysterious 1000 year-old door. Timing note: The in-game timer is now used because it's accurate and saves work. The European version run was recorded at 50 Hz, which runs slower than 60 Hz. Best time, European version: 7:07 by Mark Wong on 2009-02-18, done in 32 segments. A bloopers file is also available. I decided to a speed run of Paper Mario: The Thousand-Year Door after seeing Kyle Duffy's Paper Mario speed run and how much time he took off Philippe's run. Seeing as most of Kyle's boss strategies involved using Mega Rush, I thought that I should do likewise. However there are two choices: Mega Rush and Mega Rush P. Both are available as early as after Chapter 1, but I chose Mega Rush over Mega Rush P since it was much easier or quicker to manipulate Mario's HP to 1 than trying to manipulate Super Rank Goombella/Yoshi. Additionally, you don't need an alternate strategy for the second Doopliss fight if you use Mario. The first main difference between my run and James' run is that I did not buy 20 Fright Masks at the beginning. First of all, the incident at the beginning (which, normally, Mario loses half his coins) forces me to spend it all at the start. To buy Mega Rush, I needed 60 coins which isn't a problem (knowledge after doing Mousimilian's trouble). Additionally, I did not need (or use) 20 Fright Masks for the whole run. It may not take longer to buy Fright Masks whenever they are needed than to buy 20 and store 12 at the start, withdrawing them whenever they are needed. Speed01: This try was meant to be an experience planning run, but the experience plan got changed in the next few tries. Played on 60 Hz with a final (game) time of 7:48. After this run, I decided to record the next one. I noticed here that had to play on 50 Hz because recording on 60 Hz gives a distorted picture. I also noticed that it was harder in some places, especially in dodging enemies (see next paragraph). I did not get past Segment 3 because it was very difficult to pick up the Shine Sprite without getting an encounter with either Dry Bones (Upgrading Goombella was still planned at that point). I went back to 60 Hz to finalise my plan before I record. Speed03: Same as Speed02 with fewer mistakes and encounters. Played on 60 Hz with a final time of 6:54. The biggest mistake on this run was that I didn't know that Mario needs to be at Level 8 to instantly kill Goombas on Riverside Station with First Attack. Speed04: Changes included not picking up Close Call and not upgrading Goombella (consequently picking up fewer Shine Sprites), and ensuring that I get to Level 8 before Chapter 6. Played on 60 Hz with a final time of 6:49 (actually it's approximately 6:48:56). Speed05: This recorded run. Plan is exactly the same as in Speed04. Played on 50 Hz with a final time of approximately 7:07:47. This is the first time I played this game on 50 Hz. I specifically pointed out that I played on 50/60 Hz in the trials listed (I played on the PAL/Australian version). The main difference between playing in 50 Hz and 60 Hz is that Mario, Peach and Bowser walk slightly slower in 50 Hz than in 60 Hz. An observation I noticed was that enemies seems to be unaffected between the two frame rates, meaning that an enemy which Mario can easily outrun in 60 Hz will easily catch up to him in 50 Hz. I took some strange paths (see Segment 3, for example) to avoid enemies. The in-game timer is unaffected between the two frame rates. To compensate for the slow down and other disadvantages, I allowed one extra minute per segment, giving my initial target of 7:21. However, not everything in 50 Hz was a disadvantage. Being slightly slower, it gives me more reaction time (like dodging the two Pale Piranhas and the Cleft three times in Segment 6). Also Mario needed to be at Level 8 for First Attack to instantly kill the three Goombas in Riverside Station. I don't know what level Mario needs to be to instantly kill Dull Bones, but fortunately, Level 10 is fine. I upgrade FP each time except after the first Shadow Sirens fight, both times in Glitzville and from Chet Rippo. There were many times when I made minor mistakes (pressing B one too many times, pressing A too quickly, jumping by the door). I did not necessarily restart after a mistake, however, I tried to keep them to a minimum. There were other time wasters which happened in battle (and I have no control over) such as objects falling from the ceiling, background falling down or the mist appearing (I called them "Stage Effects"). These appear more often as soon as Mario becomes a B-list Star (Level 10). I had about 7 in the entire run and fortunately, the mist did not appear at all. I chose not to restart with every occurrence of a stage effect or minor mistake because they take a few seconds (comparing a few seconds to 7 hours (25200 seconds) makes very little difference towards the final time). For most of the segments, I made two attempts - the first attempt served as a "time-to-beat" while the second attempt was made to minimise the number of minor mistakes / stage effects. Segment 27 was the only segment where the first attempt was faster than the second. There were some segments (2, 25 for example) which I only did one attempt, because I was quite happy at the outcome or the segment would otherwise need many tries to reduce the time by a paltry 3 seconds. The Glitzville segments were an exception since the second file served as a back-up file. I included the the first attempt of the last segment because it had fewer mistakes, despite being a few seconds slower. Note: Two times are listed: the first time listed is the approximate time of this recorded run (Speed05), and the one in brackets is the approximate time in my fastest 60 Hz run (Speed04). This segment did not have any major flaws except for the last Goomba being in an inconvenient position. Unfortunately I did not get a coin drop from the Spike Goomba, however it did not matter since I pick up some of the dropped coins in Segment 4. Not executing the Action Command with the Headbonk was deliberate. Amazingly, I did this segment on the first try. It was not the fastest, though, since the Turtley Leaf's location is random and the Fire Flower jumped out in the wrong direction. Dodging Fuzzies and the Spike Goomba was the hardest part on the segment. I did not get Lucky when I really wanted to, and I got a Bingo chance, the only one I let through in the entire run. Good thing that it had failed. The Paragoomba disappeared on the way back from the black chest - I don't know why or how, but it did. I save before going up the green elevator to perform the window-jump trick on the first try. I'm glad that I could perform the window-jump trick on 50 Hz. Life Shrooms aren't necessary, so I did not pick it up. The Koopa Troopa before Hooktail didn't co-operate. I managed to avoid the nearly-impossible-to-avoid Spike Goomba before Hooktail on the first recording. However, it was overall slower than this one since it had two Bingo chances and one was successful. The Hooktail battle could be done better, especially part 2. This was the first time I played on 50 Hz, so I was not used to timing when to Guard against Hooktail's attacks (Yes, this is the worst/hardest boss in the entire game). Looking back, could it be faster to let her attack instead of saying "No" three times? I included the Peach and Bowser parts in this segment. Generally, you can't reduce the time in these parts since it is mostly dialogue. I put all of them at the end of the segment except for the Super Bowser Bros parts. I kept restarting until I get Mega Rush from Charlieton. Saying "Of course not" to Punio is slightly faster than "Guess again, nerd". Having to dodge two Pale Piranhas and a Cleft three times is the hardest part of the segment. Surprisingly, I found it easier to do that in 50 Hz than in 60 Hz. Saying "Nah" to Punio is slightly faster than saying "Sure". My method on defeating the Shadow Sirens is the same as James', only that I must have a perfect Earth Tremor. The X-Naut attacking Mario helps since I don't need an Enemy First Strike from the four Pale Piranhas encounter in the next segment. I don't know how I managed to use Hammer after Shadow Sirens and the X-Naut fights. Changing partners in battle is slightly faster than swapping them in the Party menu. I took strange paths so the Punies at the end of the pack won't get lost or left behind. I used the set of four Pale Piranhas to set Mario into Peril. I lost about 7 seconds from being too impatient at the end, but since I got lucky in having both quick Jabbi fights and getting out of the trap, I kept this. I made quite a lot of mistakes while doing this segment. The trick, which James calls the "Puni Glitch" can also be performed on 50 Hz, thankfully. James said, in his comments: "It's pretty cool killing Magnus 2.0 with one Power Bounce. : )"
It's pretty cool killing Magnus von Grapple with one Power Bounce. You will be seeing a lot those throughout the run. Jumping onto the table to collect the ticket is slightly faster as Don Pianta does not move. I saved in Glitz Pit hallways to reduce the amount I need to watch for each time I need to reset after getting an unhelpful requirement. My second file becomes a back-up file in case Red Chomps were not at Rank 2. Due to this, there were some minor mistakes in the next segments. There is a pattern on who Mario needs to fight to progress, however, sometimes two fights might get swapped around. Throughout this chapter, I fight more of the enemies than James to help reach Level 8 before Riverside Station. The items I bring and the Ice Storm in the major-league room are all the items I need for the chapter, removing the need to see the shopkeeper during a break. Both stage effects wasted time. Rescuing Yoshi is difficult due to the Toad walking past and the Hot Dog salesman running around. Magikoopas and Fuzzies were switched around. I used it to my advantage since the cake comes 2 battles after the quest involving collecting the Super Hammer. It saves me from needing to heal before Dark Craw. I changed my method of defeating Magikoopas, which helped get a faster time than my 60 Hz run. Before, I used the Fire Flower on Bob-ombs to instantly kill them. Instead, I used the Fire Flower here. Fire Flower + Gulp = 2 Magikoopas dead and a Fright Mask to scare the third. I only need star points from 2 of them so I can get a Level Up after Macho Grubba, instead of before. Dark Craw conveniently places Mario into Danger for a better method of killing Hamma, Bamma and Flare. In this battle, I deliberately missed the Action Command for Power Smash to avoid a Bingo chance. Looking back at my experience plan: It may be faster to scare all Magikoopas and defeat another set of Bill Blasters (in Chapter 5), however, Magikoopas, like Embers, are quite difficult to scare. My previous method of defeating Hamma, Bamma and Flare was to use Ice Storm hoping that the one at the back freezes, and then use Gulp twice. I want close to 66 Star Points (but not over) after defeating Hamma, Bamma and Flare. It is so that I can get Peril from Red Chomp and defeat Rawk Hawk in one move and Macho Grubba in two turns (Red Chomps: 18, scare Dark Koopatrol: 1, Rawk Hawk: 14, Total: 33). Eating the poison cake is, I think, slightly faster than not eating it. I hesitated before Red Chomps seeing "No Hammer" but thinking "No Jump". You don't need to use a special move on Rawk Hawk. Freezing Grubba skips a few seconds of dialogue. I need 12 BP at the end of the Chapter. In one of my practice runs, I forgot about this, and the second Doopliss fight was slightly more difficult. I fight Gus, now instead of before Chapter 5, to reduce Mario's HP to 4. I use a Hyper Cleft Enemy First Strike in the next segment to set Mario into Peril. I upgrade Yoshi for the extra HP and the extra attack power to kill a pair of Bill Blasters in one hit. The Crayzee Dayzees are easier to avoid now, since I have Flurrie and Yoshi, than later when I don't. The first one is the hardest one to avoid. The Ultra Shroom isn't needed so I deliberately answered the question incorrectly. Yoshi is brought to the front since the front character is more likely to be hit. Rolling is faster than walking (but riding on Yoshi is faster). I need to avoid encounters to avoid losing coins. I need to have at least 8 to buy 4 Fright Masks on Keelhaul Key. Returning to Creepy Steeple, I managed to avoid a Crayzee Dayzee. Honestly, that was a fluke. I was more careful in dodging the next two. I managed to only have one encounter in this segment. The quiz contained lots of hesitations. I was not familiar with it as either quiz in Chapters 1 or 7. It is probably better to save after Doopliss instead of after Peach. World 2 of Super Bowser Bros is quite difficult - walking on the ground slows you down, but jumping out of the water is even slower. There were some mistakes in this segment, but this try is still faster than the previous recording. Agreeing to scout is faster than saying no. I buy four Fright Masks, two each for the next two forced Ember encounters. Embers are quite unpredictable: sometimes they all run, other times they stay. I want all three Embers to run in two Fright Masks to reduce experience so I won't get an extra, unnecessary level up after Bowser/Kammy Koopa. Fortunately, I was lucky and only used one. The end of the segment could be done much better. Another short and difficult segment. Since I did not get all the star points I need to reach Level 8 by Riverside Station in Glitzville, I do the rest here. Cortez and Lord Crump combined gives 60 Star Points, leaving 21 Star Points left which comes from a Bill Blaster pair and an Ember. The star piece is almost impossible to avoid (If you do try to avoid it, chances are that you will fall in the water). I used the plane to get across because it was less risky than jumping on the ship in the background. The Cortez fight is the fastest you will ever see (on a speed run). "...the third form should have been defeated without Cortez healing. This is done by damaging Cortez to 11 HP left, and then doing the remaining damage in one turn." Or you can defeat each form in one decisive move. Lord Crump is just as quick. This segment did not contain any major error, approximately 2 seconds of mistakes. Nothing major to note except that you need to talk to Bub at least once to get the Engineer's autograph. I hesitated here. For once, I actually remembered not to ride Yoshi before the e-mail. Instead, I pressed A slightly too early. The first area with enemies is very hard - it took me lots of restarts. I use Tube Mode instead of riding Yoshi to pass by the Poison Pokeys, easily. I was very lucky to get this run on the first try - it was the second time I managed to get this result. In my practice runs, this segment or Segment 5 had the most resets. The Smorg smashing was a bit slow. I chose Thunder Rage as it is the group attacking item with the shortest animation. I was cautious with the Spring Jumping in Poshley Sanctum. In World 3 of Super Bowser Bros, it is possible to avoid being hit, but it will make the final stretch harder. After talking to Frankly, I get the e-mail first to avoid an interruption. I need nine Power Rush Badges to defeat the Shadow Sirens in two Multibounces. I have one, and need 272 pianta tokens for another eight. I accidentally selected Power Rush P which caused me to lose about 5 seconds. It might be faster to keep Power Plus, buy seven Power Rush badges, and instead sell Power Smash and Quake Hammer (Getting extra BP isn't a problem). By the time I thought about this, I was already past this segment. I save at Fahr Outpost before the wild-goose chase. This segment had a number of mistakes. I made a second attempt but it had an extra encounter which made it approximately 5 seconds longer than this try. An extra hit needed for not being in Peril does not take 5 seconds. Going to Petalburg, then to Keelhaul Key and then Poshley Heights is slightly faster than if you go to Poshley Heights first. Asking Cortez to take you back is about 8 seconds slower than if you took the pipes. Using the ledge to go to Twilight Town (as I did) is about 10 seconds faster than if you exited Rogueport Sewers and re-entered it through the grates. This segment required a lot of co-operation with the soldiers. I did not get the best situations. Some tiles can be skipped by hovering over them with Yoshi. I wonder if anyone has managed to go through the puzzle on Sublevel 3 on Yoshi the whole time... or using Yoshi to skip half the track. An Enemy First Strike from a Dry Bones sets Mario up for Peril. However, I missed the bone, but I did not lose any time since I did not need to wait for the Bombshell Bills to pass. Jumping off Yoshi right before an encounter is about a second faster than entering a fight while riding on Yoshi. In 60 Hz, it is possible to ride on Yoshi, past the three beams of fire - it is a lot harder than in 50 Hz. Riding on Yoshi in the 'sea' of Dry Bones helps reach Dark Bones faster/easier than smashing them. I save after Gloomtail, since the save point was quite convenient. I don't know whether two Multibounces is faster three Jumps against the Shadow Sirens, since Beldam likes to talk too much. There is always the possibility of stage effects - I got lucky in this segment since I did not have any, unlike in the next segment. Flurrie takes care of the last Dark Wizzerd. I save after hitting the switches since this save point is more convenient than the one before Grodus, or the one before Shadow Queen. It helped me a lot because I got hit many times by the next Chain-Chomp. Like the Smorg fight (Segment 25), I used Thunder Rage to kill all Grodus X.
I did a second try which was a second or two faster than this one. It had fewer stage effects but far too many mistakes. This one was slower because I had 3 stage effects, and Dead Hands attacked Bobbery instead of Mario - events which I had no control over. The Bomb Squad instantly triggered the event leading to the next scene (2 bombs hit main part and Left Hand, and the third only hit Left Hand). I'm quite glad that I finished the game approximately 7 hours. If you're trying to beat my time, it is easier to reach 6:49 on 60 Hz than 7:07 on 50 Hz. Since I was not recording my 60 Hz, I was a lot more lenient and allowed more errors than I would, so 6:47/6:48 is achievable, maybe 6:46 if you are lucky and skilful. Hooktail fight: Is it faster to let her attack rather than to say "No" three times? Glitzville: Against the three Magikoopas, is it faster to scare them (assuming all run on the first try) and replace the star points 'lost' with another set of Bill Blasters? Yoshi: Is it really necessary to upgrade him? Embers: Against the first of the three forced Ember encounters, will it be faster to use a Thunder Rage and Power Shell with Power Plus P badge instead of Shooting Star and Power Shell without Power Plus P? Power Rush: Will the alternate badge set-up I mentioned in Segment 26 comments be any faster? Shadow Sirens second fight: What's faster: Two Multibounces or three Jumps?